Despite its quiet, and despite the darkness around these solitary songs, the first solo album from the Black Swans singer is a deeply comforting collection, one that reaches out rather than coiling inward. 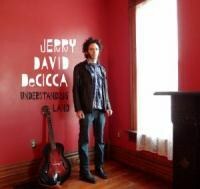 Understanding Land is Jerry David DeCicca's first solo album, and it feels deeply solo. After his last tour with the Black Swans, and their last album Occasion for Song -- which paid tribute to the band's late member Noel Sayre -- DeCicca has struck out on his own...Sort of. He recorded the basic guitar and vocals for these tracks at home, and then sent them out to various musician friends in various locales to add flourishes. The results are solitary yet communal, quiet yet sturdily built. Understanding Land is the kind of record that knows the difference between being alone and being lonely, between navel gazing and exploring more universal notions of what we do when we're left alone with our thoughts, our work, our lives. The idea of starting over, of the cycle of endings and beginnings, comes up often on Understanding Land. On opener "Before the Storm", DeCicca sings about looking "along the pillows and the cradles," referencing holes left under trees ripped from the ground by storms ("cradles") and the new soil built from the roots ("pillows"). Where things end, new things sprout up. So while his low, hushed voice sounds bittersweet when he admits, "we were born before the storm," he's not pining over burdens or licking wounds; he's recognizing a resilience, a kind of survival. Sometimes, of course, in the wake of fresh trauma, this kind of perspective is tricky. "29th of June" takes place seemingly just after "the sky tore down the town," and rather than find meaning in it, DeCicca "then gave way to the final sin / and let the flesh win." There's a wisdom in the way the album can move from lessons learned to moments of escape, from sadness to small joys, deep moments of connection. "All I do is wait for rainbows," he sings on "Colors in the Sky", "as consolation to the rain." He finds that consolation in other places on Understanding Land. "Opportunity to Love", with its lush piano chords and lilting pedal steel sounds romantic in a grand sense. A duet with Eve Searls, it cautions optimism. "Maybe it's a good time in your life," Searls keeps singing, as if DeCicca himself can't stand to admit it, especially when "all [his] good friends seem far away." Searls reminds him that there are new people to meet, that in the cradle left behind where old friends once were, there's the pillow of new friends. And even when DeCicca isn't focused on connection, he grapples with the same sort of worry within himself. "First and Last" starts with the freedom of a day alone, where the mind can wander, where it can think and create, but DeCicca beautifully relays the other side of that coin, the afternoon lull where the brain turns on itself, where the time between the first thoughts of the day and the last ones seem far away. This could be utterly depressing if it didn't feel so sweetly worn, like a situation overcome before, and it helps that Will Oldham -- himself great at rendering the solitary hopeful -- traces DeCicca's voice with his own. The music here is daringly quiet, and carries a sort of noir-ish charm. It's almost as if DeCicca worries over waking the still space around him with these songs. Still, despite their spare hush, the songs stretch out in various, striking directions. "29th of June" is clear-eyed, bluesy folk, while "Colors in the Sky" is a hazier bit of folk that plays like dream pop. "Another Bad Dream", with its perfectly phrased finger-picking and distant pedal steel, is dusty enough to imagine spaces outside of an empty house, while "Bloom Again" lets its bright, soft notes echo out into the space of possibility around them. In all of these cases, and all over Understanding Land, Jerry David DeCicca never lets the one-man nature of these songs feel insular. These songs, in the same way he reaches out across state lines and country borders to get help from friends, imagine spaces outside of the room they were created in. If they talk about finding new out of the old, in finding a new start after a long end, then they also seem to suggest that part of this process is how we think, how the sounds we make don't have to echo off those walls and back to us but rather should stretch out to places far past that. Despite its quiet, and despite the dark feel to these songs, Understanding Land is a deeply comforting collection. Leonard Cohen, who DeCicca in part channels here, said on "Anthem" that "there is a crack in everything, / that's how the light gets in." On Understanding Land, to focus on the dark around these songs, is to miss the excellent new cracks DeCicca has given us.